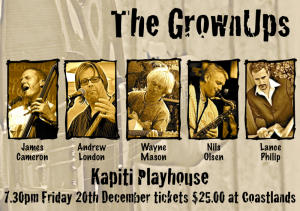 The GrownUps - Kapiti Playhouse Inc.
December 20th sees the last concert at Kapiti Playhouse for 2013. James Cameron, Andrew London, Wayne Mason, Nils Olsen, and Lance Philip take to the stage for the “The GrownUps” concert. The concert, which kicks off at the earlier time of 7.30pm, costs just $25 and tickets are available from Coastlands TicketDirect information desk. This is a great opportunity to get together a group of friends or family and make a Christmas celebration out of it. Or just come along and enjoy the great music.